With Valentine’s Day fast approaching my most common enquiry at the moment is “Can you remove my ex’s name”? The good news is I can, but it definitely won’t be removed by this Valentine’s Day as it could take the best part of a year to remove a tattoo completely. With so much bad press around Tattoo Removal I thought I would do my next blog around some of the most common questions I get asked. The laser I have is called a Q Switch Laser. The advanced technology works by allowing the light produced by the laser to pass through the skin and shatter the tattoo ink into tiny particles, once the tattoo pigment particles have been shattered; the body will dispose of the particles through its natural immune system. A gradual fading of the tattoo occurs over a series of treatments. Can you “up” the settings on the machine? The answer is yes I could, but I won’t!! Why? Because it will damage your skin which will result in scarring and pigmentation damage! I have a good reputation and I will not ruin that so please don’t ask me to “up” the settings. My priority is to remove your tattoo professionally with minimal risk to your skin. Can you see me before 6-10 weeks? Again the answer is yes, but I won’t!! Why? Because the result will be no different, my job is to break up the ink in the tattoo, and then it’s up to your body to disperse the ink through your natural immune system. By treating you before 6 weeks you could potentially damage the skin. Your skin and lymphatic system need time rebuild and by working to this time frame it ensures the best results are achieved. Tattoo removal lasers are very safe, I am a trained professional and rigorously follow all the guidelines and use all the correct safety equipment. The laser I use is non-ionizing; this means it carries no risk of cancer or other abnormal cell growth. A full medical history is taken at your initial consultation to determine whether you are suitable for the treatment. During your treatment most clients describe the sensation as similar to a hot pin prick, or the flick of an elastic band. Whilst mildly uncomfortable, most people tolerate the treatment well. A skin cooling device may be used to help reduce any discomfort. An instant whitening of the skin is seen after the treatment, but this generally fades quickly. The area is likely to feel tender for a few hours and can be red and swollen for up to 48 hours. Swelling and redness – like sunburn and lasts for only a day or two. Blistering – This is part of the normal healing process and the skin will heal correctly afterwards. Infection – There is always a risk of infection. It is very important that you maintain good levels of hygiene. Scabbing – Occasionally a scab can form, it is very important not to pick any scabbing so you’re not left with a scar. Hypopigmentation – Loss of skin colour may occur but normal skin tone should return within 6-12 months. Hyperpigmentation – A gain of skin colour may occur and is usually always a temporary effect. Pin-point bleeding or weeping – This is all normal and nothing to be concerned about. Allergic reaction – as your tattoo dye is released into your system, it may be possible to develop an allergic reaction. This is why we always do a patch test first and then wait up to 1 week before treating you. Treatment normally takes up to 30 minutes. Larger tattoos will need to be treated over several sessions. Depending on the density, colour of inks and the age of the tattoo, you may need up to 8-12 treatments spaced 6 to 10 weeks apart. Amateur tattoos can be quick to remove, taking 3 to 8 treatments. 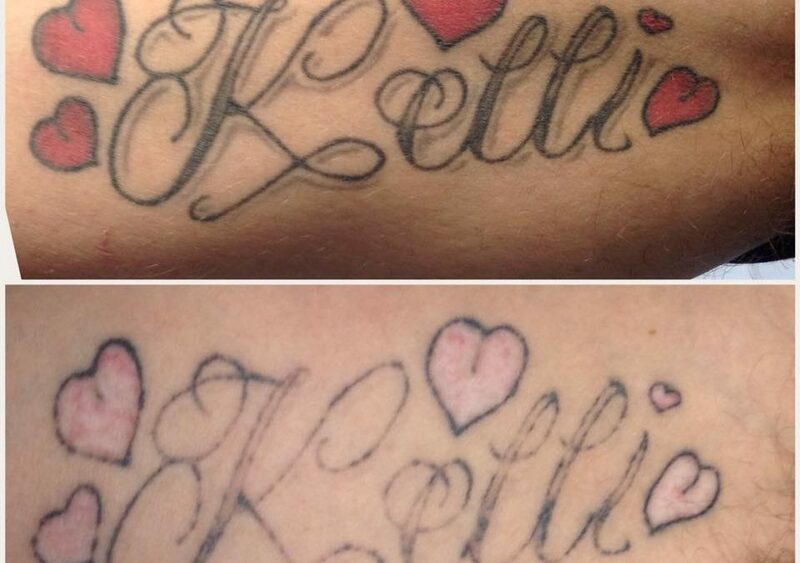 Removing a tattoo can be a long process, please be patient and committed, you will be pleased with the results. Can you remove part tattoos? I can remove part of a tattoo and also remove tattoos that are already a cover up. No, laser tattoo removal works best on tattoos of black ink. The most difficult colours to remove are green, white and some blue. If you are looking to cover up a tattoo with a new design, these colours are usually easy to cover up. If you do have green or white in your tattoo, I do have someone who I can recommend. Prices depend on the size of the tattoo, small tattoos start at £40 per session. I always recommend sending me a picture first, or coming for a free consultation so I can see the size of the tattoo and offer a price. With regards to eyebrows, prices range from £40 – £70 per session depending on how much ink is in the area. Again I recommend seeing them beforehand. My lasers give fantastic results but there are no guarantees as to whether your tattoo will be completely removed. Removal success depends on the colours of tattoo ink used, as well as the age of the tattoo, how it was applied, type of ink used, depth of ink, depth of colour, area of tattoo, your healing ability and skin type. The two things I ask for when treating a tattoo, is commitment and patience. Tattoo removal is a journey; please don’t lose sight of where you started, why you wanted the tattoo removed in the first place and the vision of the end result. I do encourage before photos, purely because sometimes when you are looking at your tattoo daily you may not notice a difference, by taking photos we can monitor the progress throughout. I am always here to help, so if you have any questions, please feel free to give me a call or book an appointment to come in for a free consultation.